The word “drone” is no longer synonymous with “futuristic.” Since the Federal Aviation Administration (FAA) passed Part 107 – regulation which opened the door for large-scale, licensed commercial drone work – the use of drones has been growing across the energy sector. Lower upfront costs of equipment and the efficiencies they provide for existing operations have also catalyzed faster adoption. Drones’ ability to provide real return on investment (ROI) across the energy industry is arguably less than two years old, yet we’re already seeing commercial drone use graduate from the fringe cases and internal exploratory studies to enterprise-wide programs being planned and implemented across large and medium-sized companies worldwide. More than an industry trend, drone programs truly offer better data to inform business decisions. They provide a practical solution for every day problems facing businesses in power Transmission and Distribution (T&D), Wind, and Solar, and they support business efforts to avoid hazardous manhours; reduce costs for maintenance, inspections, and repairs; and improve efficiencies and core competencies across operations. The value of drones is in the data they provide. The ability to capture photos of equipment is helpful, but it’s everything that happens with those photos that is the magic of an integrated drone data program. Intelligent drone data can save thousands of dollars and hundreds of hazardous man-hours, while providing better business information. Drone data is highly accurate. 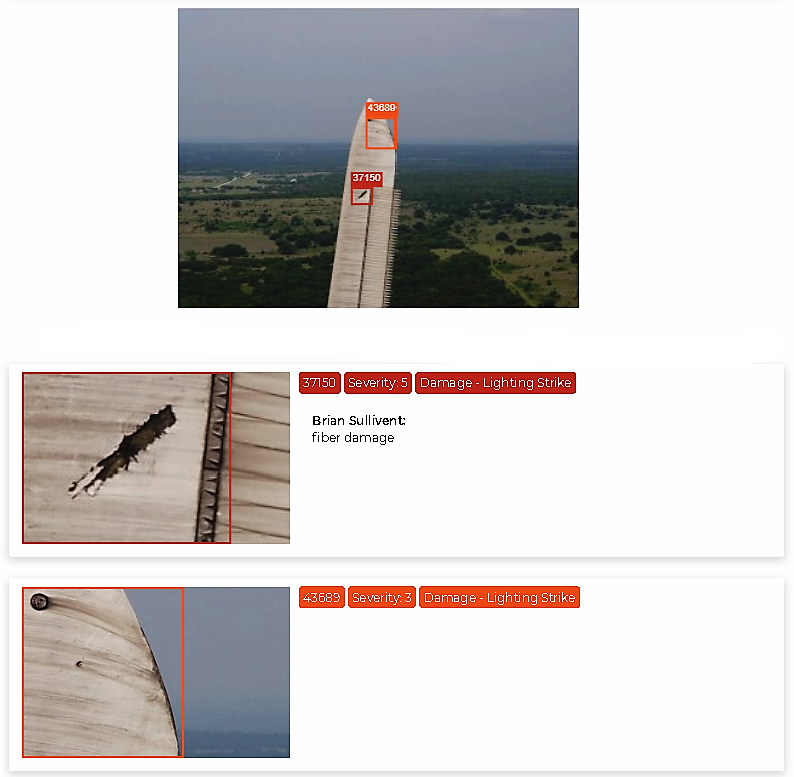 To test the accuracy of our drone inspection data, we conducted an experiment. We took the results of a solar inspection by drone and sent out manual inspection crews to run the same inspection on the same plants. The results the crews came back with from the manual inspection mirrored the results from the drone data with 99 percent accuracy, but the manual inspection took two days for each site compared to two hours with the drone. In Wind and T&D applications, drones can capture close-up, detailed imagery of potential defects that enable maintenance personnel to really see what’s going on – is the apparent damage at the surface level, or is it structural? Drones can also capture tower, pole, and turbine images from most any angle, which is often not possible with other inspection methods. 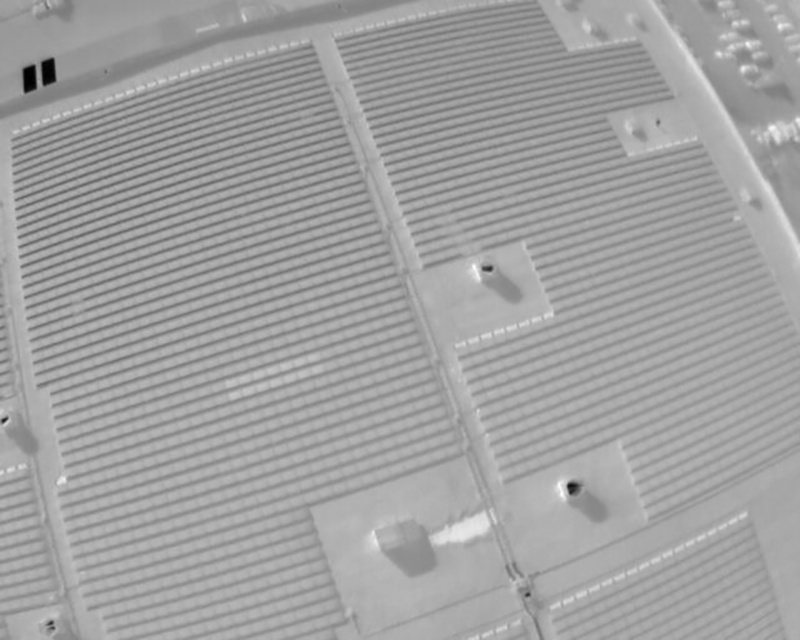 In solar applications, drones spot sub-module defects that manual inspections typically miss. These improvements in data help asset managers make better decisions about needed repairs, thus optimizing their maintenance budgets and minimizing downtime. Figure 1. Wind turbine inspection detail - Class 3 and 5 damage. Figure 2. Wind turbine inspection detail - Class 4 damage. Figure 3. RGB orthomosaic where damaged panels are highlighted. Figure 4. Thermal orthomosaic imagery - white or light sections represent defects. Drone data can be manipulated for analysis. 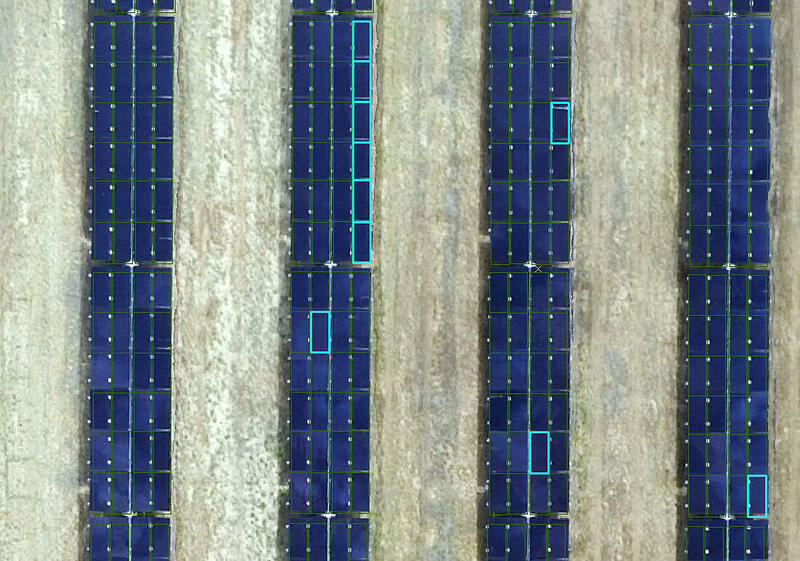 For example, with a single drone flight, you can get a clear understanding of the shading conditions of a solar site at any time of the year. During construction, you can overlay actual construction progress imagery with site plans to gauge whether construction is proceeding according to specifications. Drone data is easily consumable. “The reports are pretty consolidated,” states Nick McKee, Solar Operations Manager at AES. “I have a PDF snapshot and a digital snapshot that I can move around and customize depending on what I want to look at.” Data can even be delivered through a smart phone app, allowing field maintenance personnel to proceed directly to the location of identified defects. What many find to be the most valuable part of drone data is that it is documented and lives forever. This allows energy plants to perform year-over-year analysis and gives operations the ability to reference prior inspection data to make smart decisions about future work. Asset managers can even compare the health of equipment across multiple sites. Documentation is especially relevant where employee turnover is prevalent. In developing industries such as Wind and Solar, the employee who performed the inspection in years prior may not still be with the company by the next time an inspection is required. With drone data, you don’t have to reference a person, only a database, to know what the last inspection picked up. So what, exactly, can you use drones for? Let’s look at some sample use cases across sectors. For Transmission and Distribution operations, the drone serves a variety of near-term needs when readily accessible. While the applications are endless and new uses for drones are discovered frequently, let’s look at a few common scenarios. Imagine getting a call about a problem with a transmission tower. Without a drone, you order a lineman to go up the tower to inspect the issue, which is dangerous work to begin with. Adding to the obstacles, the only way to get to the tower might be through difficult terrain which is only accessible by way of private property, or the tower is above a line of trees, obstructing your view from the ground. With traditional means, it may take a couple days to obtain permission to walk across private property and to schedule a small crew to trek to the tower and run an inspection. With a drone and licensed pilot readily available, this can be accomplished in a matter of minutes. Drones can be used in areas too close to trees or homes for helicopters and in areas that are too difficult to access for ground patrols. There are no hazardous man-hours involved. And you get a clean look at the tower in real time, allowing your team to properly diagnose the problem and suggest a remedy before you even leave the site. During routine maintenance, a lineman sees a potential issue with a tower. A utility company that has trained and outfitted their ground patrol teams with drones can direct that lineman to get a better look at the possible defect without climbing or using bucket trucks. When a team member visually identifies a possible defect, they can quickly deploy a drone to get a higher level of detail, better classify the problem, and determine the best course of action, all while avoiding hazardous manhours. A problem is reported at a substation. Although easily accessible, substations pose a special challenge because the substation has to be turned off for a human to do the inspection. In rare situations, this can even lead to a brief power outage for customers. “Every time we fly, we're literally saving 2-3 days of work,” Stephen Dorsett, Contract Coordinator and Journeyman Lineman at Indiana Power & Light (IPL) explains. Without the drone, you'd have to obtain approval before even sending someone up in the truck, a process that could take days. A tornado has come through and damaged several towers in its path. Rather than putting men on foot to assess the damage across miles of terrain, you grab the drone and do a survey of the area. With the proper software, the photos are uploaded and stitched together, creating one cohesive map. You’re able to see the entire path of destruction and key in on the damaged areas, allowing you to quickly and efficiently plan recovery measures. Dorsett and his coworker Jessica Franklin, Transmissions Operations Engineer, note that the most value is realized when you combine the abilities of the technology with the years of experience and knowledge of your linemen. The applications of drones in Wind and Solar typically include various types of inspections conducted at each site no more than annually. Large asset owners may employ an inspection process that rotates through their portfolio of wind or solar farms. Drones offer an efficient and effective method of understanding the quality and operational health of solar and wind farms. In some scenarios, asset purchasers, financiers, or energy off-takers have a limited amount of time to assess and accept a new solar or wind farm. With intelligent planning and a skilled pilot, drones can capture a sampling of data that will quickly identify any systematic problems and provide stakeholders with the best possible information. For wind and solar plants, an annual inspection is a requirement and one of the most valuable uses of drones. Inspections that could take up to two weeks to perform via traditional methods can be done in a day or two with a trained pilot and data collection system. The data is analyzed and information about potential defects is delivered to an online portal, allowing tracking over time and across sites. In the case of Solar, data delivered to a smart phone application allows maintenance personnel to easily locate damage across potentially hundreds of acres of panels. These time savings and reductions of hazardous manhours are key priorities for AES, one of the world’s leading power companies, generating and distributing power in 16 countries. "We are reducing high-risk activities by using new technologies to improve safety, increase efficiencies, and enhance overall company asset management." “We are reducing high-risk activities by using new technologies to improve safety, increase efficiencies, and enhance overall company asset management, “ explains Asel Ayapova, Global Drone Program Manager for AES Corporation. We’ve established the who, what, when, and where of drone applications within T&D, Wind, and Solar operations. Now we’ll explore the why. What is the value of using drones as opposed to existing or alternative solutions? Drones can provide safe, efficient inspections and data collection for businesses in alternative and traditional energy. Trained pilots and experienced data analysts use drone technology to drastically reduce inspection time, save labor costs and reduce hazardous manhours, while providing higher quality data that enables companies to maximize energy production. There are a few ways that these types of inspections are typically completed today: manually, using climbing, bucket trucks or long-range photography (for wind); or by helicopter. Clearly, manual inspections involving climbing or using buckets introduce hazards that are avoided with drones. And ground-based data collection typically lacks the efficiency, detail, and flexibility that a drone can provide. Helicopters can capture data quickly and over large areas of land, but are often expensive, can’t operate near residential areas, and can’t capture images from the optimal angle or distance. For commissioning, warranty, or regular maintenance, drone inspections are 95 percent more efficient and identify defects, tracker misalignment, shading, tower and substation conditions that manual inspections might miss. Drone inspections take less than 10 minutes per MW and save, on average, $1200/MW in costs, with larger sites saving more. Their higher accuracy can help improve a site’s energy production; one customer estimated $42,000 in additional revenue resulting from repairs typically missed by a manual inspection. A solar farm inspection by drone costs up to 46% less than a manual inspection. Inspection data can be sent to a convenient smart phone app, which allows maintenance personnel to easily route to damages on site and update inspection results directly from the field. This improves efficiency and reduces costly repair hours. Drone inspections identify blade defects faster than manned inspections, avoid hazardous manhours, and improve asset productivity by catching problems before they become failures. With demonstrated inspection time per turbine of 15-30 minutes, drones reduce manhours and turbine downtime for maintenance checks by over 75 percent. Ground-based inspections typically miss 15-20 percent of damages found by drones, risking higher failure rates and energy losses. Class 5 damage, such as a lightning strike at the blade tip, can lead to 6-8% efficiency loss and 500 percent increase in failure rate, while class 3 damage, such as a trailing edge split, can result in 3-6 percent efficiency loss and 200 percent increase in failure rate. An international energy company realized a 95% return on investment for drone inspections in wind farms by way of cost savings and increased efficiencies. Drones enhance asset productivity and reduce expensive repairs by detecting and resolving maintenance issues early. 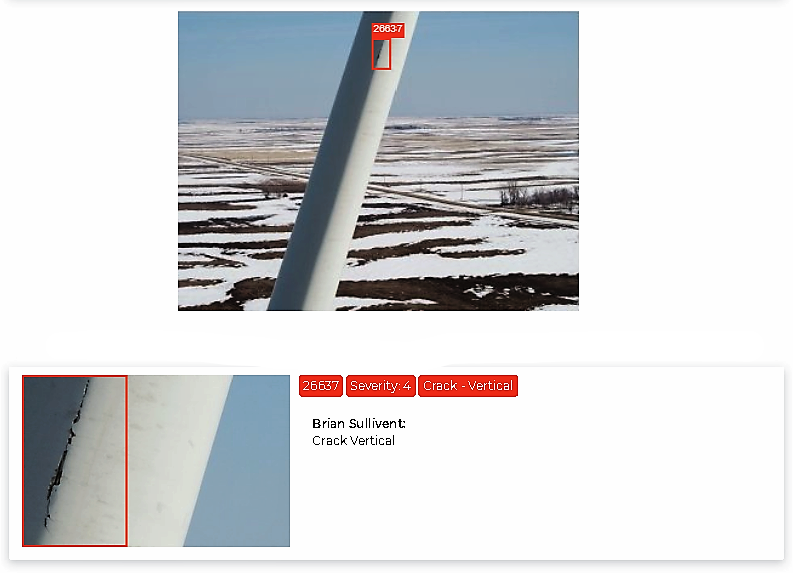 With regular drone inspections, you’ll also be able to compare assets across your portfolio, track the performance of wind turbines over time, and contrast blade manufacturers and history of damages. With an integrated drone program, you can manage and import inspection data and generate reports that can be filtered for specific needs. Drones capture detailed visual imagery, reduce maintenance costs, minimize down-time, and improve safety for electric utilities. 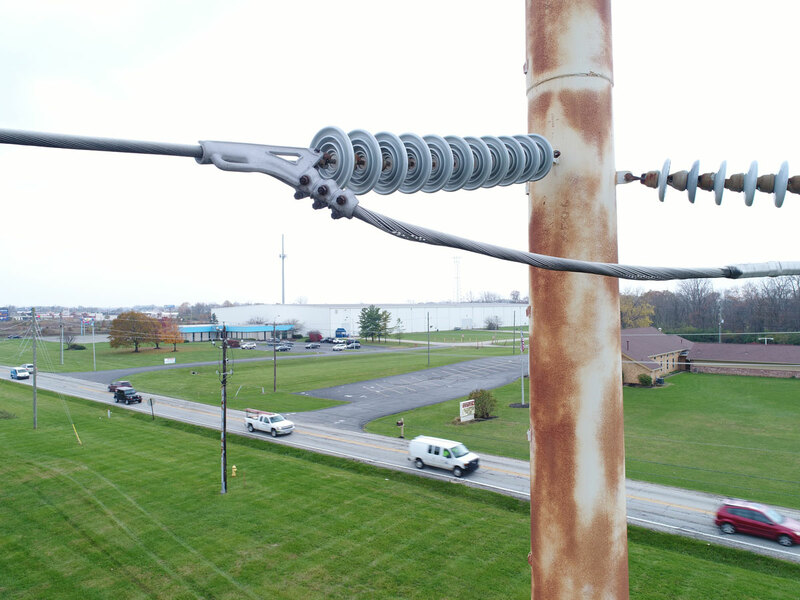 The cost of equipment, training, software, and support for an internal drone program pays for itself 5x over with just 50 miles of utility lines inspected plus 1 substation inspection. 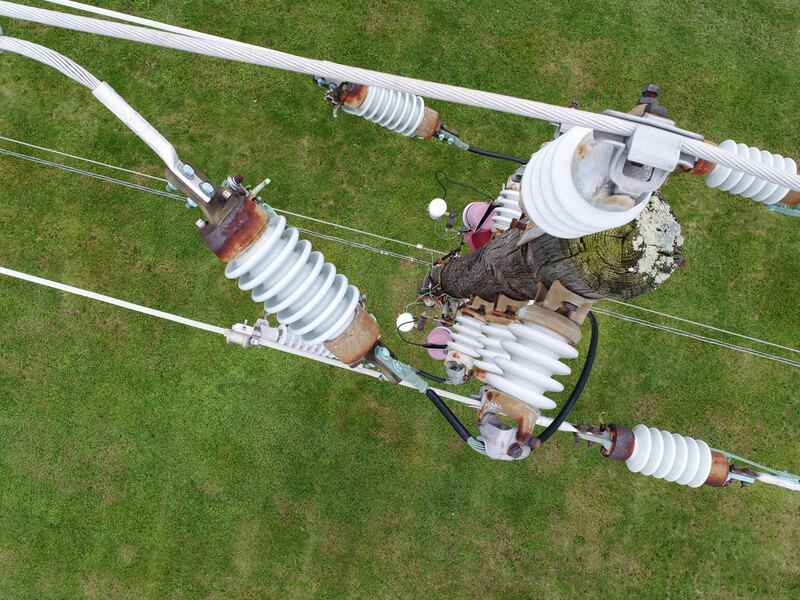 Drones can complete detailed inspections of up to 5-6 miles of transmission/distribution poles per day capturing both thermal and RGB imagery, while substation inspections can be completed within an hour. 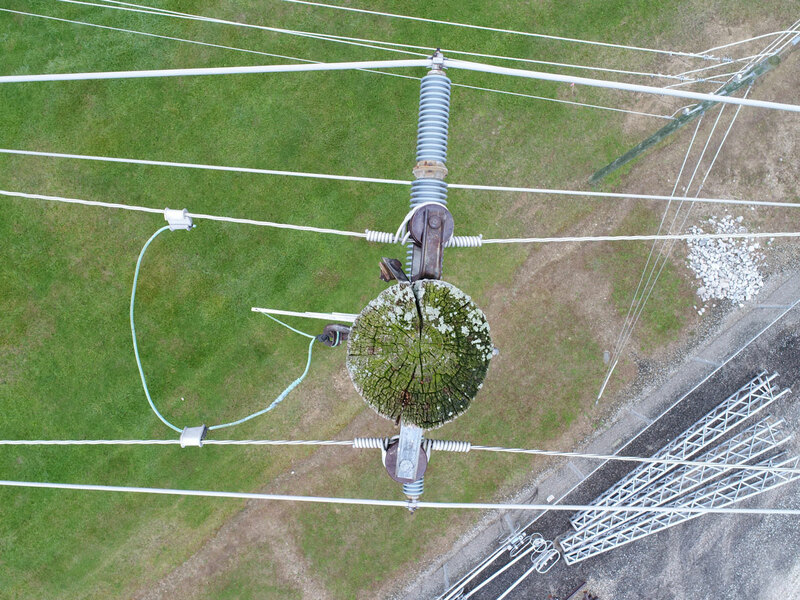 Drone inspections can deliver a higher level of detail - missing pins, rust, damaged insulators – compared to typical ground or helicopter patrols, while also avoiding the hazardous manhours involved with climbing or using buckets. Utilities may also find that they can save time and cost with drone inspections. This is especially true after a natural disaster – the terrain conditions may be unknown and using drones can help speed up power restoration. Finally, there is the data itself – the more detailed and accurate data delivered by a drone inspection can enable companies to proactively identify more defects, which could lead to fewer power outages and reduced repair costs. Although drones have become a regular part of the conversation in energy, there are still some shortcomings of the drone that have yet to be overcome that we want to address head on. Weather is a common issue that can put a damper on any type of inspection, drone or otherwise. With drones, high winds in excess of 18 mph can drain drone batteries more quickly and even higher winds can shut down operations altogether. Excessively cold or hot conditions can also shorten battery life, which means pilots get shorter flight times and need more battery swaps. The quality of data can also be negatively impacted by rain or snow cover. Location may occasionally be a challenge. Limitations in the ability to fly due to FAA airspace restrictions may affect drone usage in areas close to airports, military bases, or people. The roll-out of the Low Altitude Authorization and Notification Capability (LAANC) system, which gives licensed pilots the ability to quickly request and receive airspace authorization near participating airports, is making significant reductions to the areas that are off limits to drones. But, getting airspace authorization for restricted areas that are not participating in LAANC can still take up to 90 days. Not everyone can fly a drone, and flying a drone for commercial inspections is not the same as flying recreationally or for aerial photography. Operator skill and knowledge are critical to successful, safe data collection. Flying at the wrong altitude, using a flight path without the correct overlap, or having improperly calibrated equipment can all lead to unusable data. Mistakes like flying too close to power transmission infrastructure outputting high levels of electromagnetic fields or not following safety and regulatory guidelines can have disastrous consequences. Due to current regulations limiting drone operations beyond visual line of sight (known as BVLOS), large-scale inspections of miles and miles of transmission lines are typically not cost-effective. Drones are also not typically needed for thunderstorm recovery as most damage is visible from the ground. Thermal imagery cannot report on the reason for a hot spot on a panel. From time to time, a maintenance person may go out to inspect a defective panel only to find that the hot spot was nothing more than a leaf, bird dropping, or some other element of nature. The cost of a drone inspection and data report has to offset the potential loss incurred from the defective panels. For some solar farms, there is a minimum amount of output required by contract; therefore, as long as the farm is meeting that criteria, there may not be a financial incentive to run a full inspection. The quality of the image data is dependent on drone pilot skill and knowledge of the analyst. A trained crewman could get a better feel of what’s going on with the turbine through a manual inspection. (However, this is an extremely time-consuming and hazardous process that does not offset the costs as a drone inspection does). The good news is that drone technology and data intelligence is advancing at a rapid rate. Companies that are setting a foundation of utilizing drones now will be quick to adopt and reap the benefits of advancements as they are released. You’ve seen data surrounding the impact of drones in Transmission & Distribution, Wind, and Solar operations and you’ve heard from experts like yourself on the ground and in the field about how drones have informed business decisions; provided a practical tool to help fix everyday problems; reduced hazardous manhours, reduced direct costs associated with maintenance, inspections, and repairs; and improved efficiencies and core competencies across operations. By now, you might be scouring the web for deals on drones or visiting DJI’s website to learn which drone will work best for your needs. There are a number of nuances and considerations to take into account before dropping thousands of dollars on a drone. Before you invest in the technology and spend hours reading instructional material, consider partnering up with a company that has walked this road before, helping multiple national and international Energy companies find the best way to put drones to work for their business. First, figure out whether your specific use case is better suited for a third-party service provider, if and how you should develop your own in-house drone program from scratch, or if a hybrid approach of the two is best for you. You can request a free consultation with Measure’s Advisory Board at measure.com/contact. You can also read our comprehensive, 44-page guide, How to Incorporate Drones into Energy Operations (https://www.measure.com/how-to-drones-in-energy), which covers all the topics necessary to standing up a drone program. Drone – An unmanned aircraft that is guided remotely. Also known as an unmanned aerial vehicle (UAV). Part 107 – Also known as the FAA’s Small UAS (Unmanned Aerial Systems) Rule, which requires commercial drone operators to obtain remote pilot certification, register UAS vehicles, and comply with all FAA rules. Photogrammetry – The practice of using photography in surveying and mapping to create data capable of measuring distances between objects. Topographic Modeling – the process of representing a location that is true to the shape and features of the surface of the earth. Site Shading Assessment – Site shading analysis exhibits the effect of nearby vegetation growth, topography and infrastructure shading obstructions. The site’s geographical location and seasonal sun positioning are referenced to graph potential shading impacts over the course of the year. LAANC – Low Altitude Authorization & Notification Capability – the system the FAA built to be able to grant near-real-time authorizations for the vast majority of UAS operations. BVLOS – Stands for Beyond the Visual Line of Sight, an FAA rule that prohibits drone operators from flying a drone beyond what they can see with a naked eye. Energy Offtakers – A party to an offtake agreement, a common agreement in natural resource development where there is some guaranteed minimum level of profit.